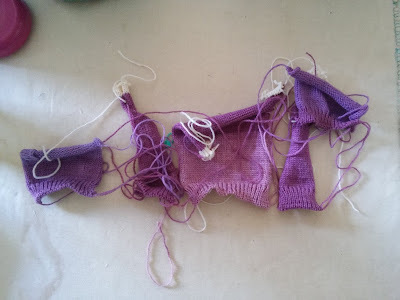 I applied the new ribbing techniques on the knitting machine and am making an AG doll hoodie. I need to make the hood yet but this Saturday is interrupted with a funeral. so we had a lesson on how to download the Skype app on a Kindle and sign in-my Mom is amazing at doing the new technological challenges! I will go and sit quietly and be very grateful. I'm virtually sitting with you, and happy you have a good relationship with your parents. Life sometimes reminds us of what's important. I'm glad you are able to connect with your parents via Skype - technology is wonderful. Glad you got the opportunity to "see" your parents. Are you sure that's going to be a hoodie? Looks like a puzzle to me!! Very fun colors for that hoodie.